Brief Synopsis – A frontiersman tries to help make peace between the US Government and the Apache Indian Tribe in the 1870’s. My Take on it – This is a film that has a very interesting premise works well showing the various sides of the Indian issue during the 1800’s in the Old West. This film isn’t 100% based on fact , yet it still manages to present things quite well. 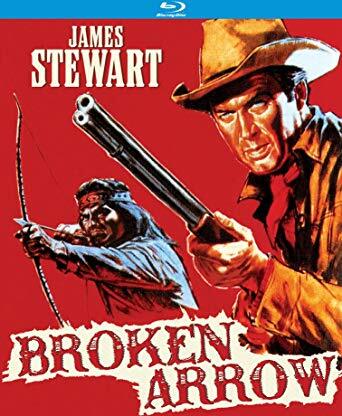 James Stewart is quite good in the lead role of a frontiersman trying to help settle peace between the US and the Apache Indians. Jeff Chandler is great as the Indian Chief Cochise who is willing to make peace as long as things are done in the right and proper way for his people. Chandler was nominated for an Oscar for Best Supporting Actor for this performance. They d a great job showing how Geronimo and his followers split form the tribe because of their desire to not make peace. This help accentuate the fact that on both sides of the conflict there were men who wanted peace and others who preferred to continue war. This is an issue that is unfortunately quite timeless and is still remains relevant even today regardless of the time or geographical location. Bottom Line – Interesting premise that works quite well to show both sides of the Indian issue. This is not completely based entirely on fact, but it is presented quite well. Stewart is great in the lead and Chandler is very good as the Indian chief Cochise who is willing to have peace if the terms are done properly. He was nominated for an Oscar for Best Supporting Actor for this performance. I liked seeing how Geronimo and his followers split from the rest of the tribe which helps show that on both sides there are men who want peace and men who want war. Unfortunately that notion has never changed no matter the geography or the place in time. Recommended!